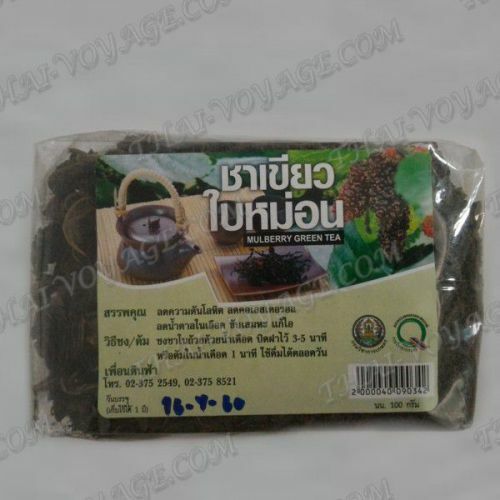 Dried mulberry leaves – healthy and delicious mulberry tea from Thai manufacturer. Mulberry tea (Morus Alba or white mulberry) – deciduous tree with white flowers and red berries. Mulberry leaves are used to brew herbal tea, which is valued for its sweet earthy taste and useful properties – mulberry tea helps lower blood pressure, improve health and normalization of blood sugar levels. The taste of the mulberry tea is soft and gentle, he can become a regular and your favorite beverage. One of the most outstanding qualities of the mulberry tea reduce blood sugar and cholesterol in the blood, even while eating fatty and high carbohydrate food. - Tea is rich in minerals and vitamins, including calcium, potassium, iron sulfate, zinc, vitamins A, B1, B2, C.
- Tea helps with age-related diseases, high blood pressure, control body weight, relieves severe stress. Infusion of mulberry leaves is prescribed as a General tonic. - Diabetes is recommended not only to drink mulberry tea (improves health and reduces the level of sugar in the blood), and before eating meals is helpful to sprinkle the powder from the leaves of the mulberry. Mulberry tea recipe: 1-2 tablespoons of dried leaves pour 250 ml of boiling water and infuse for 5 minutes. You can drink mulberry tea both hot and cold.